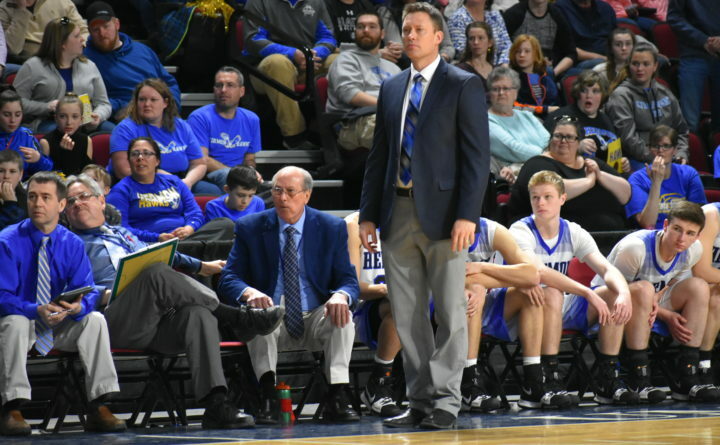 Head coach Mark Reed and the Hermon High School bench look on during a 2018 tournament game in Bangor. The Hawks edged Mount Desert Island on Friday night to extend their winning streak to 34 games. HERMON, Maine — Two familiar foes got just what they expected from each other Friday night — a defensive slugfest. But the undefeated Hermon Hawks generated just enough offense to emerge from this battle of the last two Class B boys basketball state champions with a 38-29 victory over Mount Desert Island of Bar Harbor. “We knew it was going to be a hard-fought game and thankfully we came out on top,” said Hermon senior guard Cody Hawes, who showed off his versatility at both ends of the court while scoring a game-high 16 points. Top-ranked Hermon limited MDI to 26 percent shooting (10-of-37) from the field and induced 13 turnovers. And while the Hawks shot 32 percent (13-of-41) from the field, the reigning state champs committed just seven turnovers while improving their record to 12-0 and extending their two-year winning streak to 34 games. “I was most proud of the fact that they kept their heads in a grinder type of game,” said Hermon coach Mark Reed of his team. “These games can frustrating, especially when the ball’s not going in and you’re playing against a good defensive team. Third-seeded MDI, the 2017 Class B state champ that fell to Hermon 51-38 in last year’s regional final, is now 8-3. This game was epitomized by a defensive battle between two of the Big East Conference’s top-scoring forwards in Hermon junior Isaac Varney and MDI senior Derek Collin. That game-within-the-game that ended in a stalemate. The two friends and AAU teammates went at each other defensively all night with Collin, the conference’s leading scorer, finishing with eight points while Varney scored five points and grabbed nine rebounds. “I thought Isaac and Derek played as well as they were going to with how physical the game was, and they were tough against each other,” said Norwood. Garrett Trask added 10 points for Hermon, eight during the second half, along with seven rebounds while Joel Bergeron contributed seven points and seven boards. Drew Shea paced MDI with 11 points and nine rebounds. MDI overcame 10 first-half turnovers to take an 18-16 intermission lead on late baskets by Eli Parady and Drew Shea. Hermon had jumped out to a 14-7 lead on two straight baskets by Hawes to open the second quarter before MDI closed out the half with an 11-2 runn. But Hermon, which went 0-for-10 from the 3-point arc over the first two periods, finally got its offense untracked after intermission. MDI built its lead to 23-17 on 3-pointer by Collin two minutes into the third quarter before Hermon answered with a 17-2 run to take the lead for good. A 3-pointer and two free throws by Hawes and a 3-pointer by Trask gave the Hawks a 25-23 lead, and after Shea scored on a give-and-go feed from Porter Isaacs, Hawes scored from the low post gto give Hermon a 27-25 lead entering the fourth quarter. Trask then hit another 3-pointer and Bergeron scored after grabbing an offensive rebound to push the advantage to 34-26 midway through the final period, and MDI got no closer than five points the rest of the way.